On June 11, 1940, Mussolini, carried away by what English historian F.W. Deakin called the "brutal friendship" with Hitler, declared war on France and England. In a couple of years, the Axis, initially victorious, retreated on all fronts. With the loss already in 1940 of Ethiopia, which had been Mussolini's "imperial dream", the loss of Libya in 1942, the invasion of Russia ending in a ghastly retreat littered with corpses, Italy at the beginning of 1943 was already defeated and preparing to fight on its own soil, as was to be the case in June with the Allied landing in Sicily. Fascism by now was in a serious crisis, Mussolini's popularity had completely faded. Many young people, who had grown up under Fascism, started to open their eyes and look for new directions. Between 1941 and 1943, that is in the period when the war took a disastrous turn and the regime was in shambles, the Italian cinema also started looking for new directions. Neo-realism, which was to "explode" in 1945 after the Liberation, got its start in those dark tormented years. On the one hand, there were directors, old and young, who sought refuge in films of literary inspiration, elaborate and refined, exclusively devoted to bringing to the screen, with lavish sets adn costumes: the sources were Alessandro Manzoni, Aleksander Pushkin, Thomas Hardy, Antonio Fogazzaro, Stendhal. On the other hand, beginning directors like Francesco De Robertis and his pupil, Roberto Rossellini, made war films, but devoid of propaganda, interested primarily in showing the pain and suffering caused by the war. There was one director, however, who with participation and intelligence, made use of comedy to bring audiences into contact with lower-class reality. 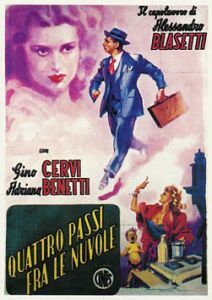 In 1942, Alessandro Blasetti directed QUATTRO PASSI FRA LE NUVOLE [FOUR STEPS AMONG THE CLOUDS] on a story by Cesare Zavattini. The script by Zavattini, Blasetti himself, Amato the producer and Aldo De Benedetti, whose name could not appear on the credit titles: he was Jewish and the racial laws prohibited him from working. A traveling salesman leaves the big city to follow an unwed mother who has gone to her parents' farm in the country and who lacks the courage to confess her condition. So the man, with all the predictable misunderstandings, passes himself off as her husband, gradually helping the woman to be accepted by her father and mother. Delicate and sentimental, but also full of life, the film gives audiences an insight into the Italian peasant world, till then somewhat neglected by a primarily urban and bourgeois cinema.